Reveal to us what’s hidden deep within. To reach for when we know the time is right. An image taken using the SHARAD, which demonstrates the depressions on Mars where researchers checked for buried ice (Photo Credit: NASA/JPL-Caltech/Univ. of Arizona). This is a Heroic Rispetto, inspired by recent research that has discovered a large deposit of frozen water underneath the surface of Mars. The deposit was discovered using the ground-penetrating Shallow Radar (SHARAD) instrument on board NASA’s Mars Reconnaissance Orbiter. The deposit has a total volume of 14,300 km3, which is roughly equivalent to the total amount of water contained within Lake Superior in the USA! 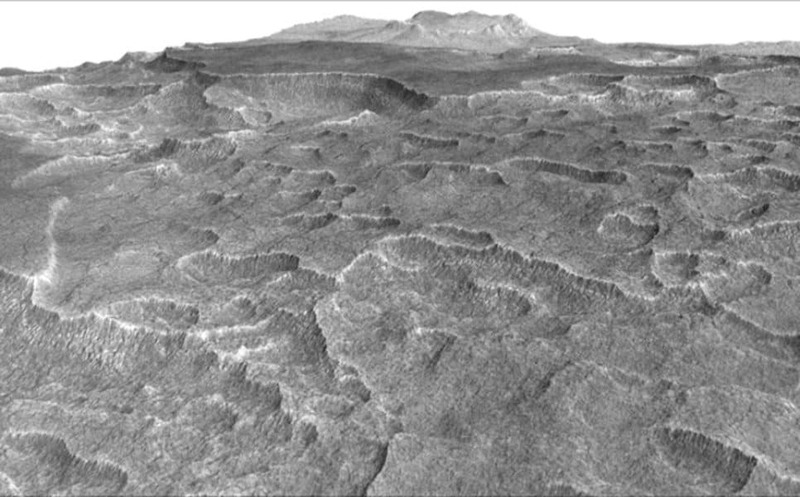 This deposit was found by looking for areas of the Martian surface that were covered in cracks and pits. In the Canadian Arctic, these land patterns indicate that there is ice underneath the surface, and this inspired the researchers to look for similar patterns on Mars using SHARAD. The deposit that was discovered in this region of Mars (the Utopia Planitia) represents less than one percent of all known water ice on the planet. Large ice deposits that are close to the surface are being considered as a source of water for sustaining astronauts in future explorations of Mars. He could write poetry without my help, I think, but I couldn’t do the sciency bit.